In the SpaceX hangar at Cape Canaveral, the Dragon spacecraft prepares for integration with the Falcon 9 launch vehicle. Visible at the base of the spacecraft is Dragon’s heat shield, made of PICA-X, the SpaceX manufactured variation on NASA’s Phenolic Impregnated Carbon Ablator (PICA) heat shield material. Dragon will reenter the Earth’s atmosphere at around 7 kilometers per second (15,660 miles per hour), heating the exterior up to 1850 degrees Celsius. However, just a few inches of the PICA-X material will keep the interior of the spacecraft at a comfortable temperature. It's taking too long to develop commercial spaceships to deliver cargo and crews to the International Space Station, members of Congress told senior NASA officials Wednesday March 28). NASA is working with private space companies to develop robotic vehicles capable of carrying food, supplies and scientific experiments to the orbiting laboratory. The agency is also trying to spur along spacecraft that can carry astronauts to the station, filling the gap left behind by the retirement of NASA's space shuttle fleet last year. But in a televised hearing on Capitol Hill Wednesday, some Congress members expressed impatience that none of these spacecraft are quite ready yet. "I hear excuses and delay after delay for the supposedly simple act of delivering cargo to the space station," said Rep. Ralph Hall (R-Texas), chairman of the House Committee on Science, Space and Technology. "NASA's spent $1.6 billion on this effort so far and the nation doesn't have very much to show for it." NASA's associate administrator for Human Exploration and Operations, Bill Gerstenmaier, urged patience to the committee. "Nothing in space is ever easy," Gerstenmaier said. "The teams have solid plans for the next year. We are working to bring commercial crew online as soon as possible." And the commercial vehicles are making progress. 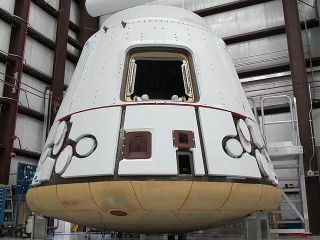 The first of the unmanned cargo ferries, the Dragon capsule built by Hawthorne, Calif.-based company SpaceX, is due to launch to the space station for the first time April 30. And the other, Orbital Science Corp. of Dulles, Va.'s Cygnus spacecraft, could lift off as early as Sept. 1. Some of the delays to these maiden launch dates are due to issues getting their launch facilities up and running. "They've spent quite a bit of time developing their launch pads; their launch pads are now up and operational," Gerstenmaier said. SpaceX is "ready to go do the launch at the end of April," he added, while the Wallops, Va., launch site for Orbital still requires a bit more work. "If we want to ensure the space station carries out the needed research and technology activities in timely and productive fashion, we have to be willing to make the needed investments," said Rep. Eddie Bernice Johnson (D-Texas). "Those continued cuts have had a negative impact on NASA's ability to carry out its missions that we should not ignore." Hall asked if there were penalties for the commercial companies when they missed deadlines. "For every slip that occurs beyond a one-month period, we get some benefit back to us," Gerstenmaier assured him, citing the example of SpaceX adding extra refrigerated storage capacity to its capsule as a consequence for a delay.